Gartner names Flexera for SAM Tools Leader! Recently Flexera was named a “market leader” in Gartner’s 2018 Magic Quadrant for Software Asset Management (SAM) Tools. We couldn’t be more proud. Well, actually we could. Because 100% of users on Gartner Peer Insights reviews recommend our FlexNet Manager Suite for Enterprises over the competition. FlexNet Manager Suite for Enterprises was the first solution to extend SAM’s value from counting licenses and compliance to software license optimization. On premises, in the data center and in the cloud. And now we’re envisioning how broader access to SAM and technology asset data will change the game. Not only for the Software Asset Manager, but also functional groups like security, IT service management, IT financial management, and enterprise architecture teams. Gartner’s companion report "Critical Capabilities for Software Asset Management Tools" gave our FlexNet Manager Suite for Enterprises the highest average score across all 10 Critical Capabilities. And the same report scores SAM solutions against three use cases to help different types of customers make strategic buying decisions. Flexera again beat every other SAM supplier in the market in both the Intermediate SAM and Advanced SAM use cases, and we also came in first amongst Gartner’s 2018 SAM Magic Quadrant leaders for small customer use cases. When it rains it pours. We believe that data is the energy fueling software asset management. Our Data Platform houses the world’s largest and most accurate technology asset data repository. And it’s changing the SAM industry. With it, every organization is able to optimize all their technology assets – and improve visibility – from software and hardware to cloud and Internet of Things devices. And it’s available to you. Now. If you would like to learn about a better way to manage your software and technology assets please contact us. Product Reviews directly from FlexNet Manager Suite users! See what other Flexera customers have to say. Flexera has a history of winning awards for our solutions and our workplace! 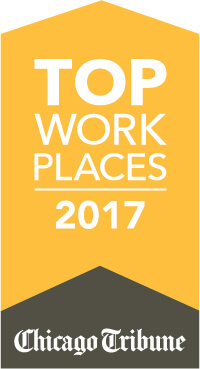 Selected as a Chicago Tribune Top 100 Workplace for the fifth time. Read the press release. FlexNet Manager Suite for Enterprises won the Software & Information Industry Association (SIIA). Read the press release. FlexNet Manager for SAP Applications selected as "Best in Class" by the ITAM Review. Read the press release.